Hyperpigmentation – one of the leading reasons individuals seek treatment from a skin care professional – has been a major skin concern for decades. It is a condition that affects men and women alike, regardless of background and skin type. Fortunately, with the right understanding of cause, common disorders, and available treatment options, there is hope for individuals facing the condition. What makes one person’s skin pigment or color different from another? With the exception of genetics and cultural background, in the intercellular layers of the skin, there exists an entire universe of the biological makeup of what affects the appearance of someone’s skin color. The flow of blood and lymph, the presence of veins, capillaries, lipids, and proteins, the thickness of the skin itself, and everything else in between are all differentiating factors that enable skin color individualism. Over time, the characteristic qualities of the skin change. Some reasons include chronological aging, environmental impact, hormone fluctuations, nutrition, diet, sun exposure, and many other uncontrollable factors, like stress. As a result, pigmentation disorders inevitably develop or, if already present, worsen. Hyperpigmentation is among one of the most prominent skin concerns for men and women of all backgrounds. Hyperpigmentation is the appearance of darkened areas of skin – typically brownish in tone, sometimes with a hint of red – caused by the hyperactivity or the excessive production of pigment. First, it is important to understand how the brown pigment is created from the beginning through a process known as melanogenesis. The thyroid hormone, tyrosine, is converted by the tyrosine enzyme, tyrosinase, into dihydroxyphenylalanine (DOPA) through oxidation, which, then, is converted to dopaquinone, the ultimate catalyst for melanin synthesis. The melanin generating process led by the melanocyte cells occurs within the melanosomes. Melanosomes are the cellular subunit organelle granules in the stratum basal leading into the stratum spinosum layers of the epidermis. The melanin then makes its way into the upper epidermis, carried by the keratinocyte cells, actuating visible skin color. There are two different types of melanin generated through melanogenesis – eumelanin and pheomelanin. Eumelanin has significant skin protecting properties. Eumelanin is critical as the skin’s primary shield against ultraviolet radiation from harmful solar rays. Eumelanin actively absorbs the ultraviolet impact on the skin along with the accompanying free radicals; hence, aggressively protecting cellular structure and well-being. Pheomelanin, on the contrary, exacerbates the skin-damaging side effects of sun exposure and actually increases the body’s production of free radicals. A uniform way to assess, and determine, a client’s skin type is by the Fitzpatrick classification scale. The scale was developed by Harvard Medical School dermatologist Thomas Fitzpatrick in 1975 to gain an understanding of a person’s skin color and likely reaction to sun exposure. It is also particularly useful in assessing and anticipating how well skin will respond to certain kinds of facial treatments or procedures. Being knowledgeable about the different skin types offers a resourceful foundation to recommend the most appropriate and effective hyperpigmentation treatment. There are six skin types, according to the Fitzpatrick scale, from very fair skin – which is type I – to the darkest skin – type VI. Type III is the most common. Types IV to VI are typical among people of African descent, who tend to be less sensitive and susceptible to sunburn and sun exposure. Across the world, skin color varies among different ethnicities. Generally, the distribution of the melanosomes is proportional in both light and dark skin; but, traditionally, hyperpigmentation is a much greater concern for darker skin types. Darker skin has larger melanocytes, whereas light skin has smaller-sized clusters of melanocytes. This means that lighter skin is better at blocking enzymatic pathways to slow tyrosinase action triggered by ultraviolet exposure. Dark skin, on the other hand, is more vulnerable to sun damage, despite the fact that it is less sensitive to the sun because there is greater tyrosinase stimulation. Several factors cause hyperpigmentation, but sun exposure is universal. It is directly responsible for worsening the condition of skin already predisposed to pigmentation, plus triggering the development of new conditions. Some of the most common forms of hyperpigmentation disorders include solar lentigos, melasma, and post-inflammatory hyperpigmentation. Solar lentigos are also known as liver spots or age spots. Although solar lentigos develop over time and are usual among a mature demographic, typically 50 years or older, they are not actually caused by aging. Rather, chronic sun exposure is accountable for actinic photo-induced aging. The dark lesions are found throughout areas of skin that cumulatively had the most exposure to the sun over time. Essentially, skin that is better protected, such as the forearms or other areas usually covered, remain impervious. Age spots are not just an aesthetic concern; they raise serious health risks surrounding skin cancer, including melanoma and basal cell carcinoma. Proactively protecting skin before spots develop is essential. Hyperpigmentation, unfortunately, is an undesirable side effect during pregnancy or among women of childbearing age who develop melasma, also referred to as “mask of pregnancy” or chloasma. Elicited by hormone fluctuations, melasma develops because the melanocyte-stimulating hormones are elevated. 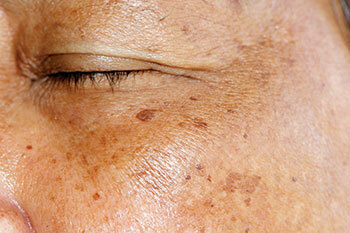 It is a chronic condition and, typically, people with melasma have considerably greater sensitivity to the sun. The slightest amount of unprotected sun exposure easily forces melanin to the surface of the skin. The presence of dark patches on the forehead, nose, cheeks, and chin are melasma-defining. This type of hyperpigmentation can clear up on its own within a few months post-pregnancy, but it is likely skin lightening treatments will be necessary. The demand for treatment of melasma is quite large and strongly desired, particularly by women who are emotionally affected by the condition. The best precaution is to use sun protection with a minimum SPF of 30 and reapply it often. Abnormal pigment alteration, also known as dyschromia, is worsened by a condition known as post-inflammatory hyperpigmentation. It develops from something as minor as post-acne blemishes, an allergic reaction, eczema, or even an injury-causing trauma to the skin. Skin that is irritated, or inflamed, is most susceptible to counter reacting because of hyperpigmentation treatment. Skin practitioners must carefully plan a suitable course of skin therapy for clients suffering from post-inflammatory hyperpigmentation. Inappropriate treatment can precipitate or induce hyperpigmentation. To emphasize, the greatest culprit of hyperpigmentation is ultraviolet exposure that progressively provokes cellular sun damage. In turn, it causes actinic keratosis, which are patches that build up on sun-exposed areas of the body. The precancerous cells are thick, crusty, and scale-like. Actinic keratosis patches are most common in lighter skinned people. Other external hyperpigmentation-causing forces are the impact of environmental air pollution, smoking, and the use of drugs or medications. These are factors that influence overall cell wellness. Smoking, in particular, deprives cells of oxygen, literally suffocating and destroying cellular structure and quality. Compromised health of cells worsens the appearance of the skin, but also it heightens skin sensitivity to the sun. A Wood’s lamp is one useful tool that professionals can use to examine skin and sun related damage. It offers professionals a method to assess how deep the skin damage goes, which provides insight on whether skin will respond to certain kinds of skin lightening treatments. Typically, epidermal damage has a much better prognosis than when it is deeply dermal. Under a Wood’s light analysis, epidermal damage will appear much darker, while dermal will appear faint. If the predominant appearance is light, meaning greater dermal damage, the client may not experience optimal results with treatment. When the examination reveals mostly darker areas, signifying mostly epidermal damage, it is almost certain that the client will have successful treatment results. Hydroquinone, naturally, is one of the constituents of propolis, the resin collected from tree buds by bees. Most likely, it is a phenol, a widely used chemical ingredient considered safe for skin lightening by the medical community. It has powerful tyrosine inhibiting action, which allows for effective hyperpigmentation lightening results. A two percent hydroquinone concentration is the highest available as an over-the-counter before requiring a prescription by a dermatologist. Hydroquinone efficacy can be amplified when combined with other skin lightening ingredients such as a two percent kojic acid or five percent alpha hydroxy acids. Although hydroquinone is safe and one of the strongest skin care ingredients in the battle against pigmentation, there are mixed feelings about it. This is why Mother Nature has been very generous in sourcing other natural alternatives. A natural ingredient that is comparable to hydroquinone is kojic acid derived from fungi. It can potentially deliver a similar tyrosinase blocking effect. The down side is, as effective as kojic acid may be, it does accompany certain risk of skin sensitivities. One point to keep in mind is that, when investing in hyperpigmentation repairing therapy, the more intense a treatment or product, the higher probability there is that certain sensitivity may occur. Shiitake mushrooms are an ingredient option also part of the fungi family, but without the concern of any adverse reactions. They provide brightening and astringent benefits to the skin, but milder and gentler. Azelaic acid is a dicarboxylic acid derived from grains like wheat, rye, and barley. In comparison to kojic acid, azelaic acid exhibits milder tyrosinase inhibiting action. It is an ingredient that hinders melanocyte regeneration, but through a more subtle approach. Azelaic acid is high in antioxidants and has anti-inflammatory properties that are valuable in treating post-inflammatory hyperpigmentation. There are five types of AHAs: glycolic acid, lactic acid, malic acid, citric acid, and tartaric acid. Each offers its own benefits, but when in combination, will enhance the results, as one AHA compliments the efficacy of the other. Glycolic acid is a derivative of sugar cane, lactic from sour milk, malic from apple, citric from lemons or other citrus fruits, and tartaric from grapes. Alpha hydroxy acids are a widely known and recognized set of ingredients among both medical and spa professionals. They are versatile and appropriate for a wide range of clients, offering them a popular, skin-brightening solution. Licorice, mulberry, arbutin, gotu kola, arginine, and even vitamin K derived from dark leaf greens offer a gentle, herbal approach to treating hyperpigmentation. Licorice root extract allows skin pigment to lighten by interfering with the melanin creating process. Mulberry contains active concentrations of betulinic acid, exhibiting anti-inflammatory, as well as skin lightening, results. It is recommended in inflamed skin, which is susceptible to pigmentation. Arbutin comes from the evergreen bearberry plant. It is too large of a molecule to penetrate the epidermis and cannot self-hydrolyze – meaning breakdown. This means that it works only topically as a mild skin lightener, but it is still effective enough to limit a certain level of melanin synthesis. Vitamin C in the form of ascorbic acid is a beloved and powerful mainstream antioxidant. It interrupts tyrosine enzyme cycles, but is active when it is in a stable, non-oxidized form. When vitamin C is a product of magnesium ascorbyl phosphate, it is most effective. Extracts including arginine coming from wheat germ, vitamin K, soy, and gotu kola – an ancient Chinese medicine remedy – are another set of ingredients that demonstrate qualities that can improve skin discoloration. Soy and gotu kola are particularly suitable to offer options in treating stress- or hormone fluctuation-provoked hyperpigmentation, such as melasma. Luckily, the selection and variety of ingredients that work to repair hyperpigmentation-afflicted skin certainly do not come up short. Skin care products containing one or several of the ingredients discussed earlier synergistically work better to improve and even skin complexion. 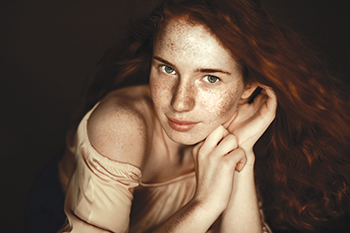 Depending on the type and severity of the hyperpigmentation, a professional will need to first assess and determine an appropriate course of treatment. Factors of consideration must include the cause and depth of the hyperpigmentation. Managing a client’s expectations are necessary to assure a positive experience. There are some forms of pigmentation that can be resistant to treatment, including dermal, hormone, and post-inflammatory related. The easier and most responsive to treatment are epidermal and sun-damage caused pigmentation. In many cases, when treating hyperpigmentation, before there is any visible improvement, the hyperpigmentation may initially become darker or worse. Many forms of treatment will likely accompany skin flaking or peeling. Regardless of the treatment, clients must stay protected from the sun and consider a necessary period of several weeks for full treatment results to take effect. With any treatment, regardless of the intensity, a proper and consistent homecare routine is critical to achieving and optimizing results. Wearing protective clothing, like a wide brim, hat is a good idea and using a broad-spectrum sun protection product of no less than SPF 30 is mandatory. 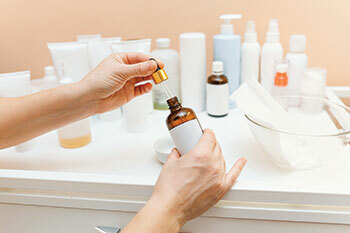 When weighing in on a spa or medical route, it is important to understand what is within an aesthetician’s scope of practice, based on the individual state regulations, and what types of procedures can be performed only within a medical practice. There are several treatment options for hyperpigmentation, including from the mildest – holistic brightening facials, microdermabrasion, chemical peels, and light therapy – to the most severe performed only under the supervision of a doctor – laser resurfacing. In the spa, an aesthetician can choose to incorporate a superficial peel, enzymes, and microdermabrasion to boost skin renewal. The exfoliating process alone promotes a brighter and even complexion. The key for any professional treating hyperpigmentation is patience; noticeable progress will be slow, but steady, especially with milder forms of treatment. Facial spa treatments geared to gently, but gradually, improve hyperpigmentation must include a wide variety of holistic tyrosinase inhibiting ingredients, mentioned earlier, that suppress further melanin pigment production. A treatment protocol can implement one or multiple forms of exfoliation to force the outer layer of skin to shed chemically, enzymatically, or mechanically. This allows the proliferation of new skin cells. 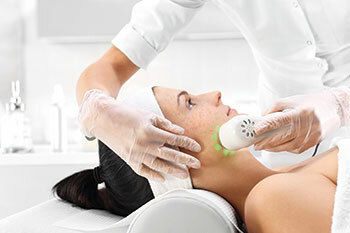 Microdermabrasion mechanically exfoliates the skin by sandblasting the outermost epidermal layer of skin. Enzymes, such as papaya- or pumpkin-derived, offer a non-chemical peeling exfoliation. A light or superficial peel with AHAs, BHA, or a Jessner’s peel works to brighten and restore the skin, but it may cause some photosensitivity, so it is not ideal to perform during the most intense, sunny months of the year. Also, keeping in mind the Fitzpatrick scale, Jessner’s peels containing resorcinol may not be a great fit with darker skin types – IV or greater – as it can trigger post-inflammatory hyperpigmentation. Incorporating an LED green light over a serum or a gentle transparent gel mask, which would allow the light to pass through and penetrate the skin, is another option to add to a facial that will help block melanin production. Overall, cumulative impact on the skin following each treatment session will generate the best results. More intensified treatments will need to be done under the care of a physician. Medium-depth peels can be performed with trichloroacetic acid (TCA) of 10 to 40 percent or a combination of TCA with other AHAs or BHA. This type of peeling is effective in treating dyschromia, but if the client is not a candidate for this type of treatment, post-inflammatory hyperpigmentation or even scarring can develop. Lighter skin types – I-III (a select group of clients) – would be suitable for this type of treatment. The post-treatment recovery time is usually between six to 10 days, depending on the particular nature and components of the peel. Treatments performed only in medical settings include intense pulse light (IPL) photo rejuvenation or the most aggressive treatment options, like deep peels and laser resurfacing. IPL therapy produces results with virtually no down-time by delivering an intense pulsing light down to the dermis to attack melanosome clusters. This forces the melanin to breakdown, or to surface, and ultimately shed away. A deep peel is usually a phenol-based peel that removes skin layers down to the dermis and has a demanding post recovery phase. Clients require rest time for the outer layer to regenerate and heal. Laser resurfacing is a procedure in which self-inflicted wounds enable new tissue generation. Today, fractional lasers are used most commonly. Fractional lasers treat the skin in a grid-like manner that allows for a shorter recovery time, since less of the area is directly impacted by the laser. The procedure is available as nonablative, for deeper dermal pigmentation, or ablative, where the laser dissolves surface cells. This modality of treatment is appropriate when looking to make a difference for the severe and resistant forms of hyperpigmentation. Hyperpigmentation has been a major skin concern that is not particularly biased to skin color or background for decades. One of the outstanding reasons that people visit a licensed skin care professional is because they are looking for options for treating hyperpigmentation. The high demand for solutions and results has enabled the medical and beauty industry to continue to research and innovate more advanced forms of treatment. No less, the tried and tested, effective remedies continue to be utilized to treat and repair hyperpigmented skin. Although hyperpigmentation disorders can be challenging for professionals to completely remedy, in the majority of cases, with appropriate treatment, continued improvement is promising. 1 Pillaiyar, T., V. Namasivayam, M. Manickam, and S.H. Jung. “Inhibitors of Melanogenesis: An Updated Review.” Journal of Medicinal Chemistry, 2018. Management Update and Expert Opinion.” Skin Therapy Letter 21, no. 1 (2016): 1-7. 3 Rhein, L.D., J.W. Fluhr, and Z.D. Draelos. “Chemical Peels, Dermabrasion, Botulinum Toxin, and Fillers in the Treatment of the Aging Face. Aging Skin: Current and Future Therapeutic Strategies (2010): 239-248. 4 Rhein, L.D., J.W. Fluhr, J.W., and J.W. Wiechers. “Mechanism of Skin Whitening Agents.” Aging Skin: Current and Future Therapeutic Strategies (2010): 253-266. 5 Epstein, E. “Actinic Keratosis.” Common Skin Disorders. 3rd Edition A Physician’s Illustrated Manual (1988): 9. 6 Baumann, L. “Cosmetic Dermatology Principles & Practices.” (2002): 99-103. 7 Pandya A.G. and I.L. Guevara. “Disorders of Hyperpigmentation.” Dermatologic Clinics 18, no. 1 (2000): 91–98. 8 Browne, J., S. Wang, and M.M. Tsoukas. “Phototherapy in cosmetic dermatology.” Clinics in Dermatology 34, no. 5 (2016): 623-627. 9 Kaufman, B.P., T. Aman, and A.F. Alexis. “Postinflammatory Hyperpigmentation: Epidemiology, Clinical Presentation, Pathogenesis and Treatment.” American Journal of Clinical Dermatology, 2017. doi: 10.1007/s40257-017-0333-6. 10 Clark CM, J.I. Silverberg, and A.F. Alexis. “A retrospective chart review to assess the safety of nonablative fractional laser resurfacing in Fitzpatrick skin types IV to VI.” Journal of Drugs in Dermatology 12, no. 4 (2013): 428–431.